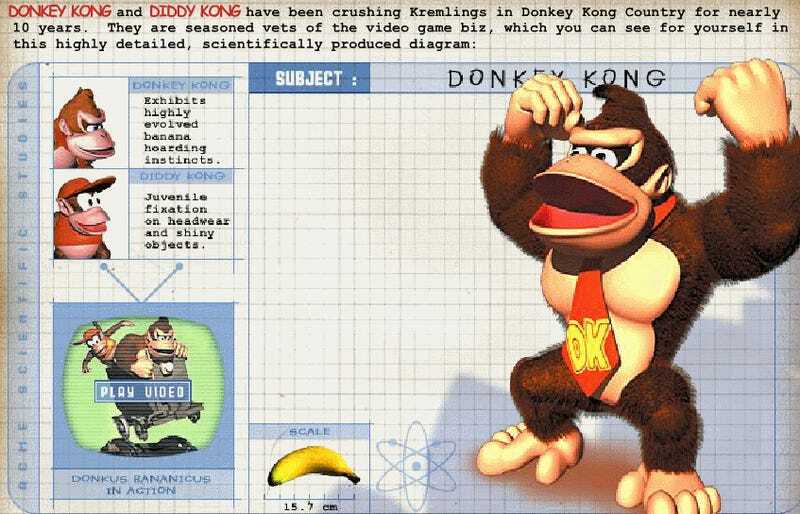 The kind of deep Donkey Kong lore you can only get from an official Nintendo flash game. Flash games have been on their way out for some time. Many are already lost, scattered to the far corners of the internet with only a handful of people on an old forum to grieve for them. As a result, one Nintendo fan has decided to collect as many of the company’s flash games as possible so they can be preserved. In the younger days of the internet, starting in the late 90s and up through the 2000s, video game companies often accompanied the marketing and release of their new products with tiny flash games that people visiting their websites could play in-browser. The idea was to get fans hyped for the latest console release by teasing information. Nintendo was one company that made a lot of these, dating all the way back to Donkey Kong Country. The SNES game might have come out in 1994, but re-releases on Game Boy and Game Boy Advance meant it was ripe for a flash game spin-off. Of course, most of these darling little treasures are hard to come by which is why YouTuber and modder Skelux has started collecting them on his website Origami64. He’s collected just over 30 of them to-date and currently has $50 bounties out on the others which are either missing a few files or still missing entirely. He recently released a video discussing the projected and demoing some of the game he’s found. One of the most robust of these flash games is for Metroid Prime. You might have seen it before and I can’t shake the feeling that I even played it at one point. It’s an object location game where you go through portals to different areas in-between clicking on everything available in search of secret objects. There are full sounds effects and animations, making it feel like the perfect precursor to Nintendo’s more modern efforts at producing stuff for smartphones. Something like the flash game for The Legend of Zelda: The Minish Cap is even more advanced, letting you play parts of the game itself recreated in a tiny browser where the items and treasures insides chests have been replaced with things like downloadable wallpapers. I also tried the Mario Party flash game which includes things like Memory Madness, a basic card matching mini-game, and Wario’s Whack Attack where you try to click on the Piranha Plants while avoiding the Bowsers that occasionally pop up. None of them are especially great games or anything. I don’t suggest taking time out of clearing icons off your map in Assassin’s Creed Origins to try and beat the flash game version of Mario vs. Donkey Kong 2: March of the Minis, for example. But they are interesting documents to gaming’s past, especially in the years when they were still trying to come to grips with this new combinations of technology and social interaction called the internet. What was the person who greedily consumed every leaked image of piece of new info about Wario’s World thinking as they sat there clicking through the flash companion game every morning while waiting for someone to message them on AIM?